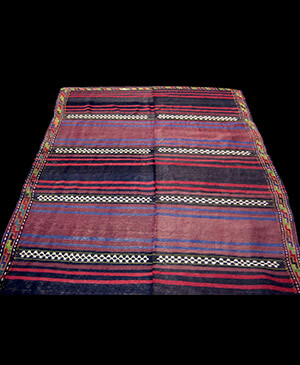 19th century examples of Persian Baluch are small dark piled rugs woven by various non-Baluch people in NE (Khurasan) Persia and in SE Persia's Sistan region. Afghan Baluch were woven in West Afghanistan by other non Baluch people like the Chahar Aimaq. Pure Baluch weaving, by Baluch nomads, occurs in West Pakistan and the Sistan area. Weaving native flat-woven textiles out of dark goat wool into rugged supplemental compound flat-weaves in the form of utilitarian bags, floor and animal covers, vanity bags and saddlebags with very few piled rugs. 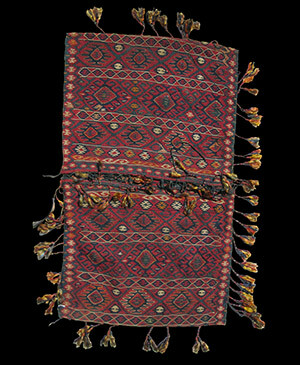 19th and early 20th century Turkic knotted regional rugs, bags and flat-weaves from Transcaucasia; a vast area between the Black Sea and Caspian Sea including the Caucasus Mountains. From the Khanate of Kuba, Azeri Daghestan, Karabagh, and Lenkoran, to Armenian atelier pieces, all from the inland coast land of the western Caspian Sea. Palas, soumakhs, saddle bags and rugs, including Cabistans, Lesghi Star Kazakhs. Farcralos, Avar and Shirvan kilims. 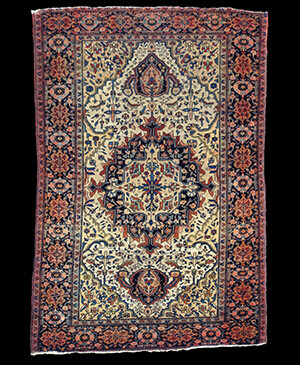 Rare, hand selected rugs from the 19th and 20th century master weavers of NW Persia and the Central Persian city looms of Isfahan and Keshan and the Farsistan tribal quarters, in SW Persia, of the Turkic tribal weaving of the Quashga'i, the Khamseh Confederacy, the Afshar and the Baktiari tribes. Also, amazingly charming, provincial, 19th century copies of court Tabriz and Kashan floral rugs of the time, by regional Feraghan and Sarouk town weavers. The copies were handsome, simpler, curvilinear, yet often with finer weaves, wool and dyes than their big city counterparts. 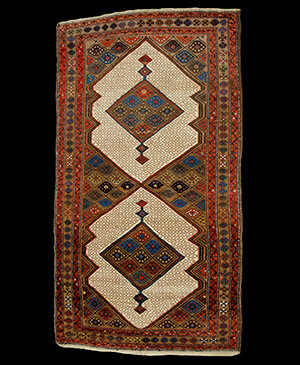 From the finest Kaiseri, Hereke and Koum Kapi silk looms, to the hypnotizing Yuruk nomad pieces that copy local regional village rugs which violate most western sensibilities yet rival the best Turkmen and Caucasian weaves of the second half of the 19th century by employing rugged and wildly colorful geometric designs and patterns of silky Angora wool. 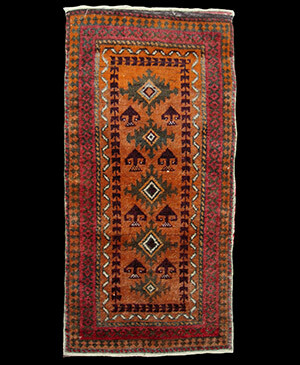 From the late 19th century end of these great Central Asian Turkmen nmads, and their incomparable textiles, are individually acquired examples of these Red rugs of the Transcaspia. Shown are various pieces and types of tribal textiles from the Ar Sare, Saryk, Salyr, Teke and Yomut Turkmen nomads. Classification of old Turkmen weaves is still unfinished, vastly complicated by the fact that they're (Turkmen weavers) essentially all copyists and their designs as a means of identification is a Rosetta Stone and changed with which ever tribe was dominant. 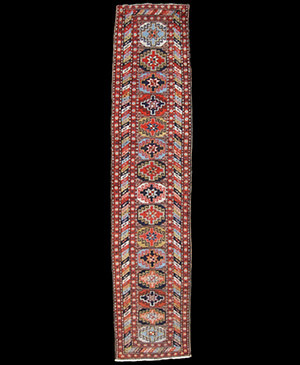 Woven for millennia in the Asia Minor and Central Asia country side by nomadic and semi-nomadic women from various tribal groups and clans. So prodigiously were they woven that for every 10,000 kilims there was only one rug. Most were used up and then thrown away by city and town dwellers. 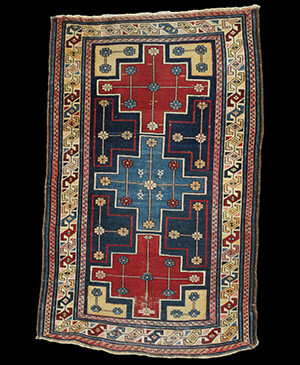 Thus, the kilim's poor reputation in the Orient as a utilitarian fabric with little or no value considering their humble and poor origins. Because it's always been held in such low esteem, it shocks the Westerner's sensibilities, who only see a beautifully crafted fabric and recoil with intrepredation at its coarse treatment. Kilims can be great works of art, are traditionally designated as folk art textile articles, and some are much finer than rugs. Others can be the stuff of dreams. Others, merely the coarsest floor covering. Others, the mobile furniture for tribal life. Here, antique runners from each of the different weaving countries are shown.